As an underwriter or sponsor of The OncoZine Brief on PRX, you’ll reach a highly desirable demographic of decision-makers, opinion leaders, and upscale consumers. While your brand will be directed associated with the program, supporting an informative will be highly appreciated. So, join us in bringing valuable information to a growing community of healthcare professionals and their conscious patients. We believe that sponsorship is most effective for both The OncoZine Brief on PRX and the underwriter - sponsor when our editorial content is closely associated with sponsors’ corporate/product brands. Sponsor messages stand out in our unique programed environment. The OncoZine Brief works with underwriters and sponsors to develop messages that can be rotated to highlight product and corporate initiatives, ensuring they will make the most of their underwriting and sponsorship while, at the same time, affecting positive change. Underwriting and Sponsorship go beyond broadcasts/podcasts. 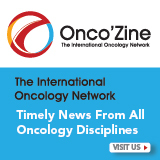 In addition to inclusion in The OncoZine Brief broadcast/podcasts, underwriters and sponsors gain access to custom components, like presence on program websites (Onco'Zine and ADC Review | Journal of Antibody-drug Conjugates), host visits, and content sharing. Our team works with your team to develop a comprehensive underwriter and sponsorship package that will meet your specific needs. Proven effectiveness. The unique brand-match approach, creates increased brand recognition and product awareness for our underwriters and sponsors. To help our underwriters and sponsor meet their marketing and media objectives, new episodes of The Onco'Zine Brief are available bi-weekly (Friday afternoons). Corporate underwriters and sponsors of The Onco'Zine Brief on PRX receive exposure to a targeted, valuable audience of consumers, executives and influential citizens in an uncluttered, editorially compatible environment. 65% have a Bachelor’s Degree or higher (compared to 27% of the U.S. total). Furthermore, research has shown that more than 80% listeners appreciate the support of underwriters and sponsors - and, as a result, think highly of their brand, products and services. For more information how to underwrite and sponsor ADC Review | Journal of Antibody-drug Conjugates and Onco'Zine, or to learn more about how underwriting and sponsoring The Onco'Zine Brief can help you meet your goals, contact Shaun Mehr.